The Island of March 21, 2015 reports that a heated exchange had ensued in Parliament on President Sirisena’s decision to allow the National Anthem to be sung both in Sinhala and Tamil. After one Member of Parliament had pointed out that allowing the National Anthem to be sung in Tamil would be a violation of the Constitution, a variety of comments were made by several MPs that collectively reflected a range of perceptions regarding the National Anthem. One MP inquired that since the National Anthem had been written in Tamil “how is it that it is sung only in Sinhala”. Another stated that the National Anthem “written in Tamil was the same as the Sinhala one”. Continuing, he had added: “It can be sung alternatively in either Tamil or Sinhala depending on the majority of the populace in the relevant area. However, when it comes to state and National functions it must be sung in Sinhala”. Since National Anthems and National Flags are symbols of a nation, Constitutional guidelines invariably exist to govern their use and deployment. It is apparent from the breadth and arbitrariness of the range of comments cited in Parliament, that either there is a seriously flawed interpretation of the current Constitutional provisions governing the National Anthem, or that there is only a vague notion of the existence of such provisions within Parliament. “The National Anthem of the Republic of Sri Lanka shall be “Sri Lanka Matha”, the words and music of which are set out in the Third Schedule”. Article 7 is also listed in Article 83, as one of several Articles that require a 2/3 majority and approval by the People at a referendum if any of its provisions are amended. In view of the Constitutional provisions of Article 7, if singing of the National Anthem in Tamil does not cause the words and music of Sri Lanka Matha given in the Third Schedule of the Constitution to be altered, there is no issue. It could be sung anywhere regardless of the composition of the audience. If on the other hand, singing the National Anthem in Tamil causes the “words and music” of Sri Lanka Matha to be altered, it would be in violation of the Constitution. The understanding of Article 7 by most, including the Member of Parliament who first raised the issue, is that when the National Anthem is sung it cannot deviate from the words and music as given in the Third Schedule. The words could be written in any script, e.g., Sinhala, English or Tamil. But whatever script is used, the words and the music must be as in Sri Lanka Matha. This is perfectly illustrated by the English version of the National Anthem. The English version uses letters from the English alphabet but when it is sung the words and music are identical to the Sinhala version. The same should be the case for the Tamil version too. The script could use Tamil letters but the sound when sung should be “Sri Lanka Matha”. If on the other hand the Tamil version in the Third Schedule is such that the sound when sung is not “Sri Lanka Matha”, Article 7 would be violated. Perhaps the intention of the framers of Article 7 was that whatever language is used in the script, the words and music of the National Anthem w ould be common to all communities so that they could stand together and jointly commit to one country and one Sri Lankan nation. In view of President Sirisena’s decision to allow the National Anthem to be sung in Sinhala and Tamil it is imperative therefore that a determination is made as to whether the decision amounts to a violation of the Constitution, or not. One way is for the President to seek an opinion from the Supreme Court in keeping with Article 129. Since such an opinion would be “held in private” it would be more transparent and preferable if the determination of the Supreme Court is in response to a Petition. This latter approach would bring closure to the issue. The comment made in Parliament that the “SLFP fully supports the decision to sing the national anthem in Tamil”, must mean that the SLFP has already determined that doing so would not violate the Constitution. The recommendation of the LLRC in paragraph 8.296 is: “On the question of the National Anthem being sung simultaneously in two languages to the same tune must be maintained and supported. Any change in the practice at the present time would only create a major irritant which would not be conducive to fostering post conflict reconciliation”. Since singing in two languages “simultaneously” would NOT conform with the Constitutional requirement that the “words and music” of Sri Lanka Matha should be as per the Third Schedule, the recommendation of the LLRC appears to mean that reconciliation even at the expense of violating the Constitution is acceptable. This is unacceptable by any standards of the “Rule of Law”. The natural question that arises is: What other Constitutional provisions are to be violated in the name of fostering reconciliation? Would not the preferred option be to amend the Constitution to suit measures that foster reconciliation rather than blatantly violate the Constitution simply to avoid facing a “major irritant”. To label those who wish to have this issue constitutionally resolved as ‘racists and extremists’ by commentators and by fellow members of Parliament reflects a misplaced notion of what Rule of Law really means, and a complete disregard for the primary document – the Constitution – that enshrines the corpus of Laws that govern the Government of Sri Lanka. However, if there is a popular demand for the National Anthem to be sung in Sinhala and Tamil, and Article 7 is an impediment, the Government has to initiate an Amendment that would secure a 2/3 approval of Parliament and approval by the People at a referendum. To have the National Anthem sung in Sinhala and Tamil for “feel good” reasons because it is “absurd” not to do so, or in order to foster reconciliation in violation of the law would be a betrayal of the mandate given by the People to this Government to uphold the Constitution and the rule of law. 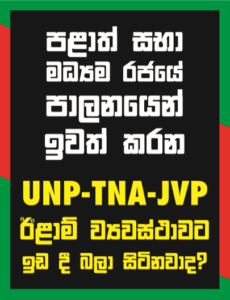 UNDP Resident Representative Subinay Nandy uses Goebbels principle to support LTTE propaganda machine.